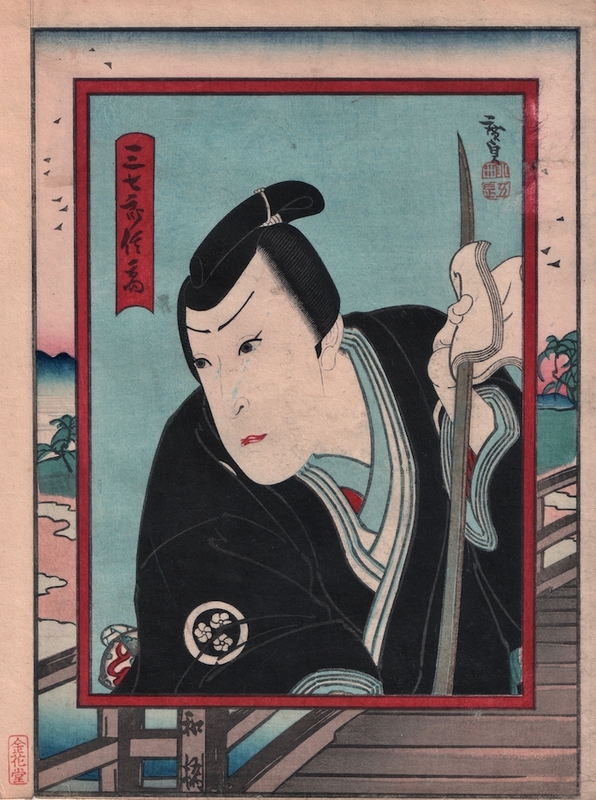 Konishi Hirosada (ca 1810 - 1864) Actor Palimpsest on a Bridge, 1840’s. Deluxe Chuban. This very nice Hirosada print is unusual and exciting because of the use of the inset, 'frame within a frame' device. The print seems to show a sensitive portrait of an actor, delicate features and thoughtful expression, in the process of a grim task… cleaning the blood off a blade with tissues. The simple portrait is complicated though, by being suspended in front of another scene. What makes this so unusual is that the scene behind is almost completely obscured. It is possible to make out the handrail and a few of the planks of a bridge in the foreground, some water and some hills beyond… beyond that almost nothing can be determined from the deliberately obscured scene. Like an avante garde game or piece of drollery, there is the strong impression given that if one could only peel the portrait off, the whole scene would exist beneath the apparently 'applied' surface. It is a fascinating, inexplicable, enigma of a picture. The actor and the role are lost forever… there does not seem to be another copy of the print in existence. Colour, impression, and condition are all good. Embossing to the landscape. A unique object.